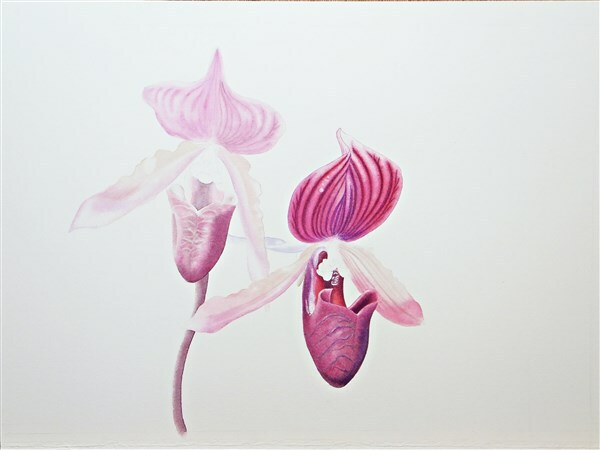 With the Welsh Orchid Festival at the National Botanic Garden of Wales in early September, I'm working like crazy to get some paintings finished. 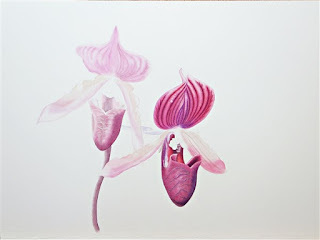 On the easel today is this lovely Orchid. I'm not sure whether it's a species or hybrid, but the colours are amazing! Trying to capture it is a challenge of the nicest kind and trying to photograph it is an even bigger challenge, so my apologies for the lack of colour accuracy on this one, you'll just have to come see it at the Orchid Festival. Others are also in the finishing stage! Also on my mind at the moment is the small matter of my Artist Statement, which really needs to be written. But I'm afraid I'm with Edward Hopper on this matter, so it's a particular and peculiar problem for me. Nevertheless it must be done, and done it will be. - and there will be Orchids, all sorts including ones you won't see in the shops! This may sound a bit like a cliche~ but write it from your heart. Ha ha Paul, if only it were that simple, I have serious statement block. Trying to convey what I want to say without sounding like too much of a lunatic is so difficult.